Legend has it that when critics of Gen. Ulysses S. Grant complained to President Abraham Lincoln about Grant's drinking, Lincoln replied, "I wish some of you would tell me the brand of whiskey that Grant drinks. I would like to send a barrel of it to my other generals." Grant's favorite brand is said to be Old Crow, a Kentucky straight bourbon whiskey that is still sold today. With Steven Spielberg's film "Lincoln" due to hit theaters in November and the Civil War sesquicentennial under way, it's anyone's guess whether supporters of the North will scour liquor store shelves so they can sip Grant's favorite bourbon while Southern sympathizers seek a suitable counterpart. 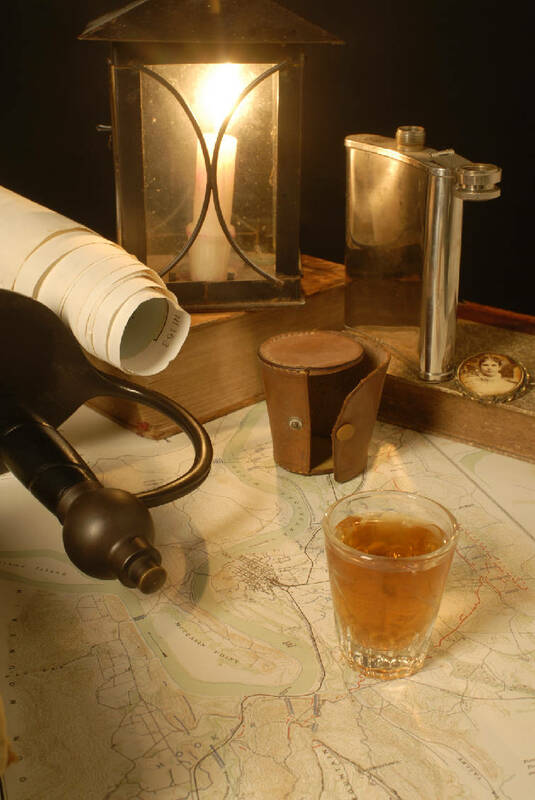 One thing's certain: Whiskey and other forms of alcohol played a role in the epic conflict, from the tax on whiskey that helped fund the Union Army to an incident in Chattanooga that sent one of Grant's colonels home in disgrace. "Grant was what we would call today a binge drinker," said Chickamauga and Chattanooga National Military Park historian Jim Ogden. And -- Lincoln's quip aside -- it was a serious matter to the North. A principal responsibility for Grant's chief of staff, Brig. Gen. John Rawlins, was, Ogden said, "to make sure Grant did not succumb to the temptation ... to drink." Grant decided before the war that he needed to get his drinking under control, Ogden said, which he did through abstinence. But temptation loomed when Grant had his headquarters at the Latner House at 320 Walnut St. in downtown Chattanooga. Rawlins kept a wary eye on Col. Clark B. Lagow, one of Grant's staff officers who had a penchant for partying. Rawlins worried Lagow might offer Grant a drink. "Rawlins goes to Grant and says [Lagow] must go," Ogden said. "He is setting you up for a fall from the wagon." Things came to head before the Battle of Missionary Ridge, a key Union victory that took place on Nov. 24-25, 1863. According to a diary from the time, Lagow threw "quite a disgraceful party" at the Latner House on Nov. 14. "General Grant breaks up the party himself at 4 in the morning," Ogden said. Lagow was "greatly mortified," Ogden said, and tendered his resignation not long after that. Despite Grant's reputation as a drinker, Ogden said, "During the Civil War there is not a documented case where any use of alcohol by Grant negatively impacted his performance in the field." That's not the case for Confederate Gen. Benjamin Franklin Cheatham, a Tennessean who was so drunk on Dec. 31, 1862, Ogden said, "he actually fell out of the saddle at one point" at what Southerners called the Battle of Murfreesboro and Northerners call the Battle of Stones River. Cheatham and Confederate Gen. Braxton Bragg didn't see eye-to-eye on things, Ogden said, and "that incident only further reduced Bragg's opinion of him." Cheatham survived the war, and later earned a whiskey-related honor. "There was an early Jack Daniel's bottle with a portrait of Cheatham on it," Ogden said. So Jack Daniel's might qualify as a Southern sympathizer's counterpart to Old Crow, though the Jack Daniel Distillery wasn't formally founded until 1866, after the Civil War ended. Rebel Yell, a bourbon that was created to "personify the South" and has a label showing a Rebel soldier charging off to battle, wasn't created until 1936. Chattanooga had its own brand, Deep Spring Whiskey, that was launched in 1866, the same year as Jack Daniel's. It had advertising that paid homage to the Confederacy. A Deep Spring Whiskey poster shows Gen. Robert E. Lee on horseback, surrounded by soldiers carrying aloft Confederate flags. In the foreground, a female battlefield nurse holds a hefty glass of whiskey to the lips of a wounded Rebel soldier. A case of Deep Spring Whiskey is shown near his bandaged leg. "Deep Spring distillery was on the south end of what today is the Market Street Bridge," said Joe Ledbetter, co-founder of the modern-day Chattanooga Whiskey Co., which has sold some 3,000 cases of Chattanooga-branded whiskey since starting up six months ago. The whiskey is distilled in Indiana, because distilleries aren't allowed in Chattanooga, but Ledbetter's business is campaigning to repeal the law prohibiting distilleries here. Civil War re-enactors who wanted to get their whiskey right wouldn't want to buy a bottle off the shelf, anyway, because that's not how Civil War soldiers drank, said Michael Veach, Associate Curator for Special Collections at the Filson Historical Society in Louisville, Ky.
"The major package for selling whiskey was the barrel. You would take your flask or your jug to the liquor store or saloon and get it filled there," said Veach, who's authored a book due out in February: "Kentucky Bourbon Whiskey an American Heritage." "It wasn't bottled by the distiller," Veach said. "Bottles were very expensive at that time, because they had to be hand-blown." While discouraged by the Army brass, soldiers did whatever they could to get their hands on booze. "Alcohol was an extremely pervasive part of United States culture," Ogden said. The South prohibited bourbon distilling during the war, Veach said, partly because corn was needed to feed soldiers. "The other big thing was, they wanted the copper for the stills, so they could turn that copper into cannons," he said. The North kept whiskeymaking going and taxed it, Veach said. Whiskey, and the tax on it, is intertwined with American history, he said. "It paid for the Revolutionary War debts," Veach said. President Thomas Jefferson repealed the whiskey tax in 1802, but it was reinstated from 1814-1817 to fund the War of 1812. The tax on whiskey was reinstated in 1861 and has remained in place since then, Veach said, accounting at times for between 50 percent and 70 percent of the federal budget.